First, periodically conduct a visual check of your brake pads. Any brake pad less than 1/4 inch thick should be replaced very soon. If any brake pad is less than 1/8 inch thick, you risk damaging your rotors if you don't get it replaced immediately. Secondly, listen for any strange noises when you apply your brakes while driving. Audible squealing and metallic noises are sure signs of problems with your brake system. Depending on the damage, you may need to get your rotors resurfaced or changed. As with other repairs, getting your brake pads changed too soon is much better than getting a replacement too late. In this way, you can avoid costly repairs and unsafe driving. 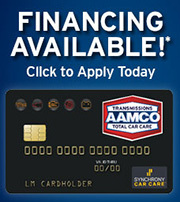 At AAMCO of Henderson, we understand the critical importance of your brake system to your vehicle. That is why we take great care with all of our brake system service and repairs. 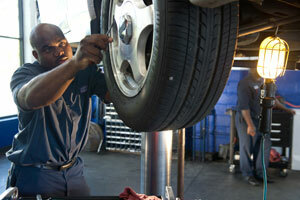 As part of our service, your expert technician will examine your entire brake system. Individual components we will inspect include brake pads and shoes, hydraulic fluids, rotors and drums, calipers, wheel cylinders, brake hardware, hoses, lines, master cylinders, and anti-lock brake systems. For the proper safety and performance of your vehicle, we end all repairs with a road test. This ensures that your brake system is operating at a high level.